Long before you take possession of your actual boat license, it’s drilled into your head that you shouldn’t operate any boat while drinking. Boating and alcohol are a horrible combination for a lot of different reasons. It’s even against the law to carry alcohol on your boat at all in Canada unless it is in an unopened container with an unbroken seal, or in a closed compartment not readily accessible to anyone onboard. Here are seven reasons why it is always a bad idea to drink while boating. When you operate a water vessel while under the influence of alcohol, your judgment is impaired, just like it is any other time you drink. Your ability to process information is affected, which often results in decision-making that will put yourself, your passengers and anyone else out on the water in danger. Anyone who has been under the influence of alcohol knows that your reflexes aren’t quite what they should be. Just like when you’re in a car, this causes big problems when you’re in control of a boat. Your ability to react to other boats or other people in the water slows, and that extra second or two could mean a serious collision. Drinking and boating also impairs your motor skills, which not only increases your risk of crashing the boat, but also increases your chances of falling overboard. Motor skills refer to the precise movement of muscles that’s designed to perform a specific task. Loss of motor skills due to alcohol affects your balance, depth perception, coordination and peripheral vision. Boater fatigue is a condition that is extremely dangerous when combined with alcohol. Ordinarily, the effects of the sun, wind, vibration, noise and boat motion cause what is known as boater fatigue. When you drink, the effects of the alcohol can be up to four times greater because of boater fatigue. In other words, it’s like you drank four times more than you actually did. The Criminal Code of Canada says that is a criminal offence to operate a vessel on any Canadian waterway, while impaired. Your boat license will certainly be in jeopardy if your blood alcohol level is higher than 0.08 mg. It’s also a criminal offense to refuse to comply with the request from an enforcement officer. If an enforcement officer wants to come aboard to ask questions or check things out, you are obligated to comply. You will certainly face charges if you’re impaired, but you can also be charged if you’re not impaired and just enjoying one drink while in control of the boat. Basically, if you value your boat license and clean criminal record, keep the alcohol out of the boat. Even though a long day on the water can dehydrate you all on its own, adding alcohol to the equation can make it happen even faster. What’s worse, the dehydration makes you feel the effects of the alcohol faster, meaning all of the negative effects will be even worse. Adding death to the list may seem a little extreme, but people die on the water in alcohol-related incidents every year. Drinking alcohol slows your breathing rate and swallowing capabilities and can increase your chances of drowning if you fall overboard. If you are dehydrated and fall in, you will experience leg and abdominal cramps faster, which can also lead to drowning. No matter which way you look at it, boating and drinking alcohol are two activities that should never be done together under any circumstances. BOATsmart! 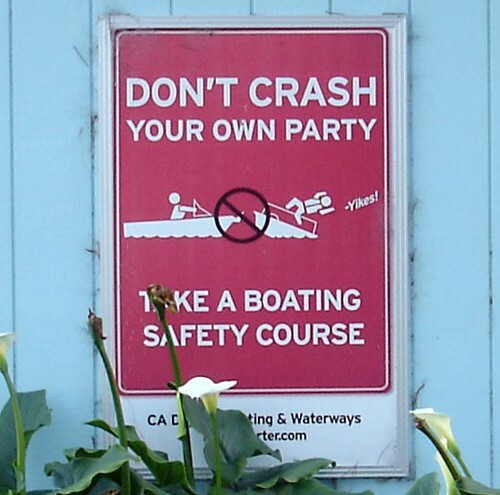 Canada wants you to have a safe and fun summer on the water. Learn boating safety online, pass your boat test and get your official boating license, the Pleasure Craft Operator Card.